Ben Cohen and candidate Amaar Campa Najir, among others, at Sunday’s combination political rally and ice cream social. 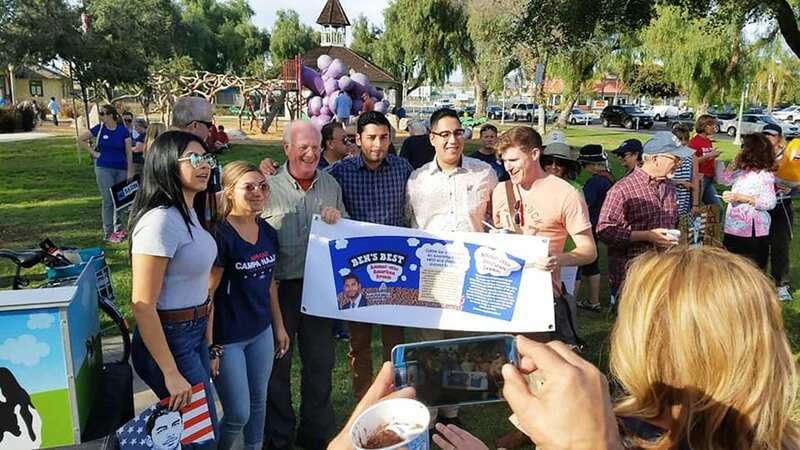 Sunday it was a combination of old-fashioned ice cream social and political rally as Ben & Jerry’s co-founder Ben Cohen served up ice cream at Grape Day Park to advocate the campaign for Congress of 50th District congressional candidate Ammar Campa-Najjar. The candidate spoke to his supporters during the afternoon event, which lasted about 90 minutes. Everyone got a small dish of ice cream with two flavors. The Ammar-etto flavor wasn’t quite ready yet, but Cohen promised it would be coming soon. Ben Cohen and Jerry Greenfield, the co-founders of Ben & Jerry’s Ice Cream, have teamed up with MoveOn to launch Ben and Jerry Take Back Congress, Flavor by Flavor to help seven progressive candidates running for Congress.